Longtime activist Frances Crowe before she is taken to Berkshire County House of Corrections after her arrest for trespassing on a Tennessee Gas Pipeline Saturday. Frances Crowe, considered a legend for her peace activism and anti-nuclear efforts, was pushed in her wheelchair to the edge of the open pipeline trench with seven other Sugar Shack Alliance members, causing Tennessee Gas Pipeline Co. workers to stop heavy machine work and call police. 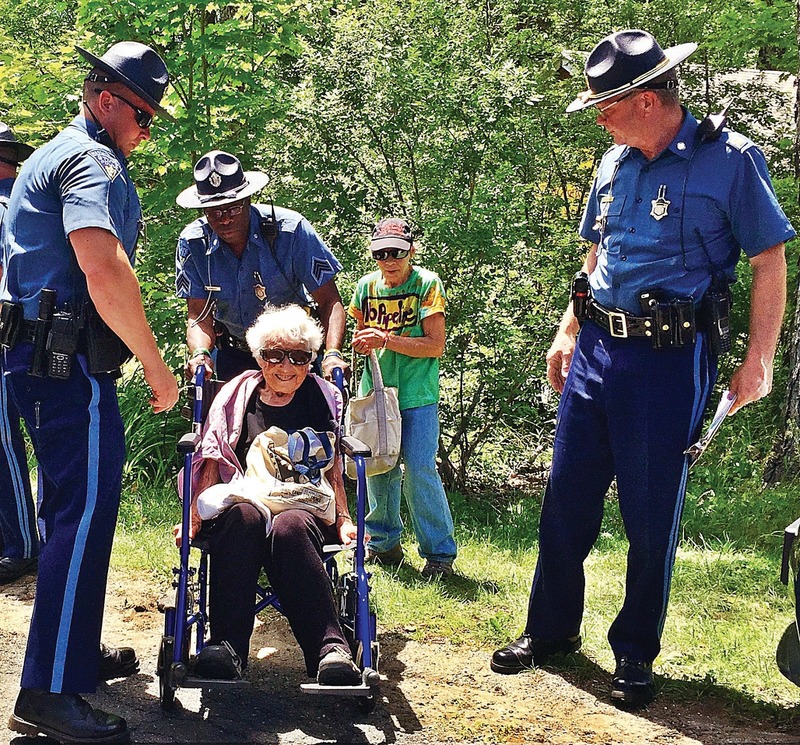 Surrounded by state police after her arrest, fellow activists pushed her uphill through the pipeline easement to the backseat of a sheriff's cruiser, and when asked how many times she has been arrested, she smiled. "Not enough," she said, prompting loads of laughter. This is the third time Crowe has been arrested since she turned 90, after a long life with numerous arrests. 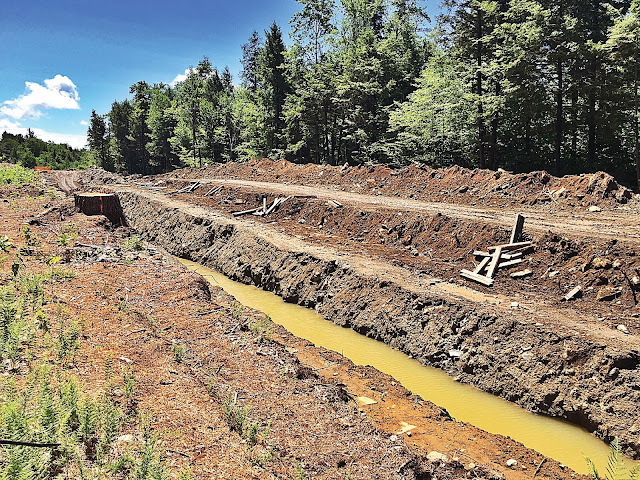 The arrests Saturday were a third round of peaceful protests since the Kinder Morgan subsidiary began work last month to its $93 million Connecticut Expansion Project, a 13-mile natural gas storage loop, part of which will run through an existing pipeline corridor in Otis State Forest. The project, which was approved by the Federal Energy Regulatory Commission last year, has stirred anger from local residents and activists for many reasons, and particularly because the company - after a court battle with the state - won an easement of roughly two miles of state-owned and protected land. Crowe, who lives in Northampton, said she's been at this since 1945, when she was 26. 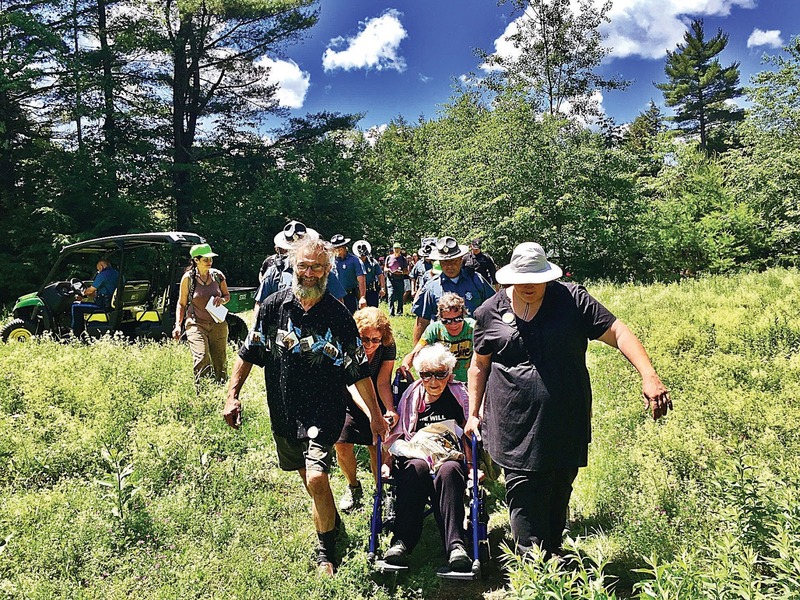 After becoming a peace activist, and later a war tax refuser, she said she was part of Shut It Down, a group that helped close the Vermont Yankee Nuclear Power Station in 2014. Now it's hydro-fracked gas she is working against. "I am very much opposed to taking our fuel out of the ground," she said. "We can meet our needs with wind and solar. This is the answer for the future." "My life has been devoted to trying to wake people up," she added. "We just don't want anyone to get run over here," said Major Michael Habel, gesturing to all kinds of blocked traffic on this rough rural road. "We understand that they have the right to do this." The protesters then walked the road to their staging ground, holding up tractor-trailers carrying pipes and other workers, who rolled down their windows to talk to police. The group sang and cheered as Crowe was arrested. While six were put in the van headed for jail, Connie Harvard got arrested partly so she could stay with Crowe. Watching the scene, which again stopped traffic, activist Terran Giacomimi said Crowe was an inspiration. "She's a fighter," she said. "For the people." 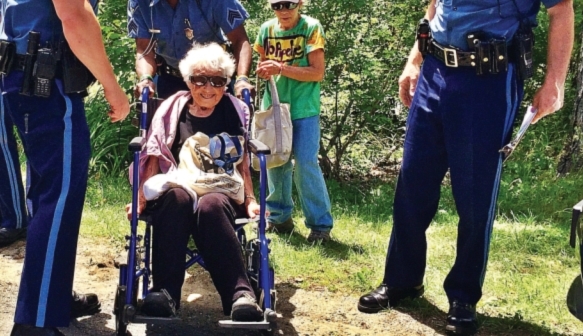 Responses to "98-Year-Old Woman Arrested in Tennessee Gas Pipeline Protest"